Beautifully engraved certificate from the Tickets.com. This historic document was printed by the Security-Columbian United States Banknote Corporation and has an ornate border around it with a vignette of the company logo. This item has the printed signatures of the Company’s President and Secretary. Tickets.com is a leading global live event ticketing solutions provider. The company facilitates the sale of tickets by enabling venues to sell tickets and manage ticket operations through a variety of distribution channels. Tickets.com develops private label Ticketing Gateways(SM) to service live entertainment organizations with e-commerce distribution platforms. The company also distributes tickets for clients to consumers at www.tickets.com and through private label branded sites, providing tickets and information on virtually all events and entertainment organizations. 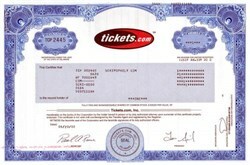 Tickets.com's automated ticketing solutions are used by thousands of entertainment organizations such as leading performing arts centers, professional sports organizations and various stadiums and arenas in the U.S., Canada, Europe, Australia and Latin America. Tickets.com was the official ticketing supplier to the 2002 Olympic Winter Games as well as the official online ticketing solutions provider for MLB Advanced Media, LP. In 1999, the stock peaked over $160 / share. The company went through a management restructuring in May 2002.